I loved having pets as a little girl and have enjoyed their presence at home over the years. At various stages of my life, I have had pets as diverse as turtles, lovebirds, parrots, squirrels, pigeons and rabbits. But, for the last four or five years, my two beautiful Persian cats have been my favourites. I also have an aquarium of the most exotic and colourful fish and I find it soothing to watch them swim gracefully, oblivious to the rest of the world. Fluffy was the first cat that came into my house and he was just a two weeks old at that time. He was very small and needed to be handled with kids' gloves. He was too little to eat solid food and we even had to feed him milk with an ink-filler. He was obviously very shaky in the new surroundings and took a while to get comfortable with and closely attached to our family. He is a brown Persian cat and has grown big and handsome and is now the pride of my home with his regal, tiger-like demeanour and stern yet loving nature. When Fluffy was six months old, we brought a mate for him. 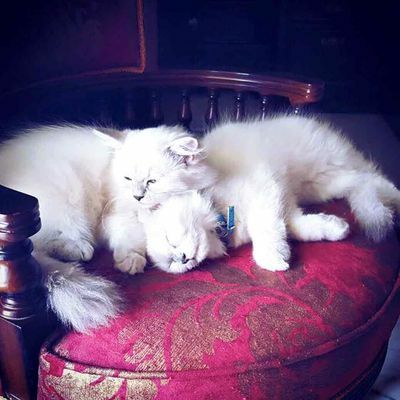 Posh, the pure white Persian cat with her powder puff looks, is a coy, pretty female who acts pricey at times, making the big guy run after her. But Fluffy adores her. She is gentle and sleeps on my bed whenever I am home, while Fluffy prefers to spend time in my parents' room. Both cats regularly visit the local pet parlour for their baths and routine grooming and, in that sense, are a bit spoilt. I think that cats make adorable pets and are extremely loving. Both Fluffy and Posh are very sensitive and seem to instinctively sense that we are leaving home at least a few hours before I am ready to take off for another tennis tour. They look tense and concerned as though awaiting a minor calamity and I always find this a little disturbing. However, their joy and excitement at seeing us back from the tour is very refreshing. We have now added two delightful little kittens to our household and the three-month-old females have been named Heer and Zara. They bring in a lot of positive energy and are extremely naughty and playful, which makes it a lot of fun to have them around. They are a mixture of Persian and Siamese breeds and are delightfully cuddly and cute. They now complete a family of four—three demanding females and a male—and that is very similar to the Mirza household in Hyderabad.